Two sets of transmission lines operating at 66 kV cross Burnside Park in north-west Christchurch (see the location on Google maps). I made measurements of the ELF (extremely low frequency) magnetic fields at around 9 am on a cold morning. This means that the magnetic fields would probably be higher than usual (as the lines would be carrying more current than they normally do). I made the measurements where the conductors (cables) sag closest to the ground, starting at a point between the two sets of lines (along the dark blue line on the aerial photo). Distances were measured going north and south from this point, and the magnetic field measurements were taken 1 metre above the ground. The magnetic field level (in microtesla) is shown in the graph below (negative distances are south of the lines). The arrows on the graph show where the conductors were overhead. To put the field levels into context, the maximum level measured is similar to what you might measure next to an electric range with the oven and one or two hob elements on, and is well below the limit recommended by the Ministry of Health. 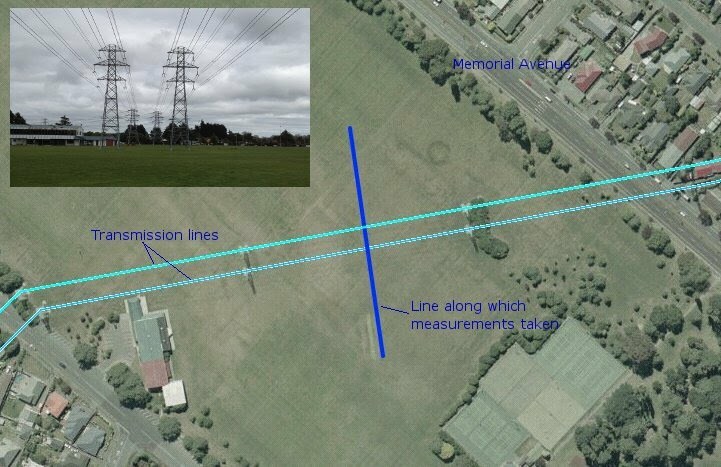 At distances greater than 50 metres, the levels are similar to what might be found in many New Zealand houses which are well away from transmission lines. Any questions about these measurements? Get in touch.